Ghana Muslim Student Association (GMSA) paid a visit to SESRIC to familiarize themselves with the activities of the organization and build closer collaboration and partnership. 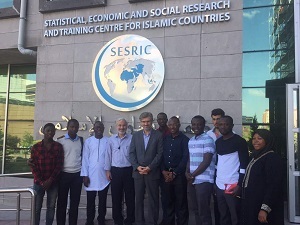 During the visit, Mr. Mehmet Fatih Serenli, Director of the Training and Technical Cooperation Department at SESRIC, welcomed the participants and gave an outline of the history and the operation of the OIC. He added that SESRIC is the main technical organ of the OIC; and the main statistical bank in the Islamic world which offers capacity building training and policy recommendations to member countries. Mr. Abdul Rahman Al-Hassan the president of GMSA said his association was established in 1972 and 45 years down the line the association now has 10 regional secretariats across all the regions of Ghana. Their main aim is to be ambassadors of Islam through unity and peaceful coexistence. He also added that GMSA offers Dawah training for women and religious leaders like Imams to build their capacities to better counter the issues of radicalization and terrorism. He announced that plans are underway to establish a regional Muslim student association that will be an umbrella body for all associations in the sub-region. In his concluding remarks, Mr. Serenli said this could be a new beginning for Muslims in Ghana and urged the students to maintain their unity and try to expand their association by creating an alumni association to better keep track and benefit from the ones that already graduated and starts professional lives.